You guys probably know by now that I’m a big fan of one pot and one pan meals. 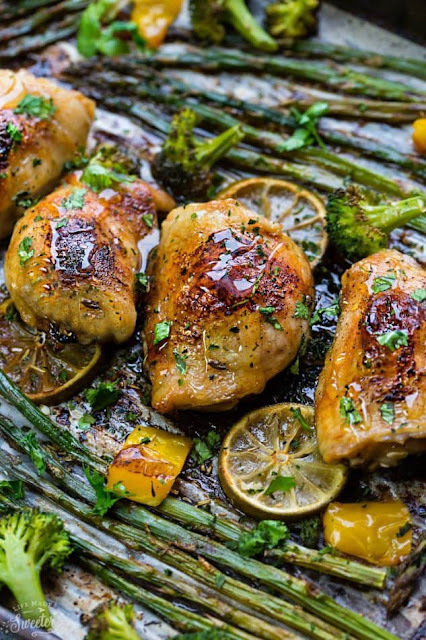 Like this One Pot Teriyaki Rice or this Lemon Herb Chicken Sheet Pan. They are the perfect solution when you don’t feel like washing a ton of dishes. Sheet pan meals are especially great for easy clean up. They’re the best for those busy weeknights when you don’t have time to be stuck standing over a hot stove. For this Honey Lime Chicken Sheet Pan dish, I used chicken thighs this time just because I find they’re less likely to dry out as they cook. You can totally use chicken breasts if that’s what you have on hand though. Just be sure to adjust the cooking time according to the size of the chicken. This recipe also works great with lemon juice instead of lime if that’s what you have on hand. Side of your choice: rice pasta, quinoa, farro, potatoes etc. After 20 minutes, remove baking pan from the oven, flip the chicken and place the asparagus, broccoli and bell peppers a long the sides of the chicken. Sprinkle the chicken and vegetables with seasonings and drizzle sauce over the vegetables and some more on the chicken (reserve 1 teaspoon for the end). 0 Response to "HONEY LIME CHICKEN SHEET PAN WITH ASPARAGUS"